August is one of the hottest months of the year for nearly everybody, so it’s a great time to stay in the air conditioning and get a little education. 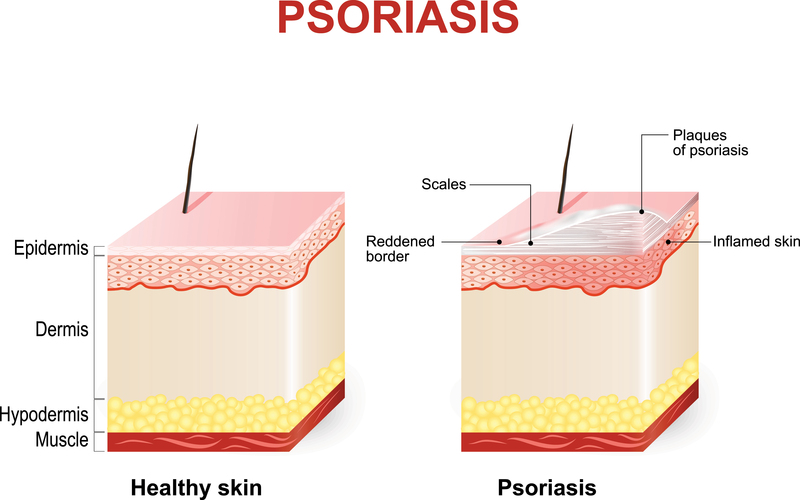 This week’s lesson is on psoriasis, a chronic condition that’s more than skin deep. Research shows it’s the result of several factors, including your immune system, genetics and environmental exposure. There are different types of psoriasis, but I’m going to concentrate on the most common form, plaque psoriasis. The American Academy of Dermatology reports that about 80 to 90 percent of people with psoriasis develop this form. 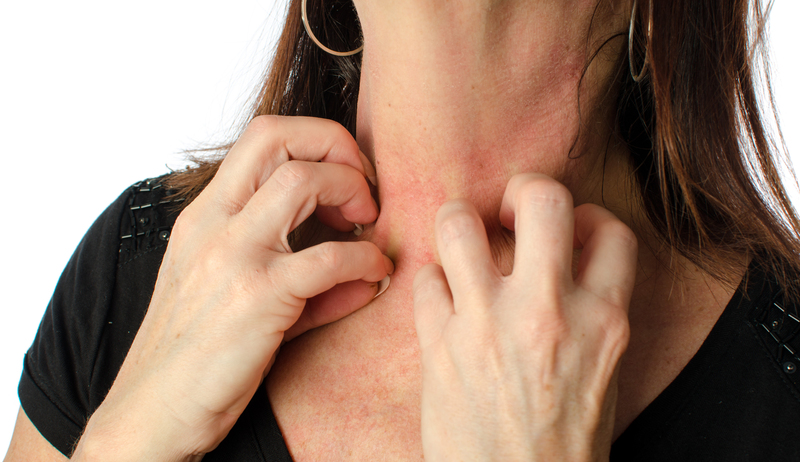 With plaque psoriasis, people get red, itchy patches on their skin called plaques. So, where do these plaques come from? Well, normally, the life cycle of skin cells involves producing new skin cells and shedding the old. This cycle takes about a month to complete. With plaque psoriasis, your immune system goes into overdrive and triggers inflammation, causing the skin to produce new cells double quick. So, the skin cell life cycle gets cut to about a week instead of a month. The problem is the skin can’t shed the old, dead cells that fast. Instead, the old cells pile on top of each on the surface of the skin, forming the thick, red, flaky plaques. Often, the plaques get thin, dry, silvery scales on them. The skin around them might burn or be painful or crack and bleed. The plaques can form anywhere on your body, but the most common locations are the knees, elbows, torso and scalp. They tend to vary in size, and can appear as a single spot or as a cluster that covers a large area of your body. 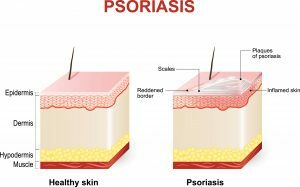 Most people who have psoriasis have it their entire lives, but it generally clears up for a while then flares up again. There are many things that can cause your psoriasis to flare. Some people carry one or more genes linked to the development of psoriasis. One out of three people with the condition have a relative who also has it. However, not everyone with these genes gets the disease. It’s believed that certain environment factors trigger the genes and result in the disease becoming active. There are a number of outside factors that trigger a psoriasis flare or worsen one in progress. Some of the more common triggers include infection such as strep throat, injury to the skin, smoking, changes in the weather, heavy alcohol use, a deficiency in Vitamin D, stress, and medications, including lithium, iodides, and certain blood pressure and antimalarial drugs. Identifying your triggers and avoiding them is one way to help manage your psoriasis. Your dermatologist can usually diagnose psoriasis by asking you questions about your medical history and symptoms, then examining your skin. He or she may take a small sample of affected skin to examine under the microscope. This may be done to rule out other skin disorders as well as to confirm the psoriasis diagnosis and determine the type of psoriasis. Following diagnosis, your doctor will develop a treatment plan. The plan usually begins with topical creams and ointments, especially if you have mild to moderate disease. These treatments include topical corticosteroids, Vitamin D and retinoids. If your disease is more severe or you don’t respond to the topical creams, your dermatologist may try phototherapy or oral or injected medications that work throughout your body. Phototherapy uses natural or artificial ultraviolet light to slow the creation of new skin cells. Your doctor may try a systemic oral medication such as methotrexate or cyclosporine, or an injected biologic such as Humira, Cosentyx, Stelara or Taltz to clear your skin from a flare. In March of this year, a new, purportedly more powerful drug was approved by the FDA for the treatment of adults with moderate to severe plaque psoriasis. It’s called tildrakizumab-asmn or Ilumya. It became available by prescription in the US earlier this summer. Ilumya, an injection administered every 12 weeks, is approved for patients who are candidates for systemic medications or phototherapy, according to its manufacturer Sun Pharmaceuticals. The drug works to reduce inflammation by inhibiting the release of certain pro-inflammatory substances from the immune system called cytokines. Avoid skin injuries. Be more careful when working and shaving (men and women) to avoid nicks and cuts, and be sure to use insect-repellant outdoors to prevent bug bites. Get a small amount of sunlight, but don’t get burned. A brief period in the sun can help improve your psoriasis, but too much can trigger or worsen a flare, not to mention put you at greater risk for skin cancer. Soak in a lukewarm tub every day. Put colloidal oatmeal, Epsom salts or Dead Sea salts in the water to calm inflamed skin. Don’t use very hot water or harsh soaps. Mild soap has oil and fat that can help soothe your skin. Pat yourself dry after soaking about ten minutes. Limit your alcohol intake. Alcohol can be a trigger, and it can decrease the effectiveness of many of the medications used to treat psoriasis. If you drink, do it in moderation. Control stress. Stress can be a trigger and it can make managing psoriasis more difficult. Take time in your day to relax. Try a relaxation techniques such as yoga, meditation or deep breathing. If you need more help de-stressing, talk to your doctor. Exercise and Eat Healthy. A healthy lifestyle is good for you in general and can help you maintain a positive attitude. That positivity will make you stronger and more capable of managing your psoriasis on a daily basis.